Stock traders marvel at the power of being able to automatically sell a position when it loses a certain amount of capital once they discover this tool. Sesasoned professionals marvel at the fact most traders don’t use these powerful risk management tools. If you would like to learn when and where to place stop losses to manage risk like the professionals, you can sign up for one of our TRADEPRO Subscriptions here. In today’s post, we will discuss how to actually place stop losses on option spreads with Interactive Brokers. Imagine purchasing a bull call spread strategy, in anticipation that the stock will increase in price. Let’s assume this spread cost you $500 for one contract. If you wish to only risk $300 on the trade, simple, you place your stop for $2.00 per option spread right? Wrong. Using the price of options for stop losses does not actually reflect what is going on in the underlying stock price. If the stock is only a few cents away from a support level, it doesn’t matter that the option spread is trading at $2.00, it is worth taking a little more risk and seeing if the support holds on the stock. The main problem is this – using options prices for stop losses completely ignores the technicals of the actual stock on which the options are based. True professional traders use another method. Professionals use the stock price to trigger the sale of the option spread. This allows you to sit in the trade while the probabilities of a winning trade are high. When a stock breaks below a key support – then it is time to dump the option spread, no matter what it trades at. 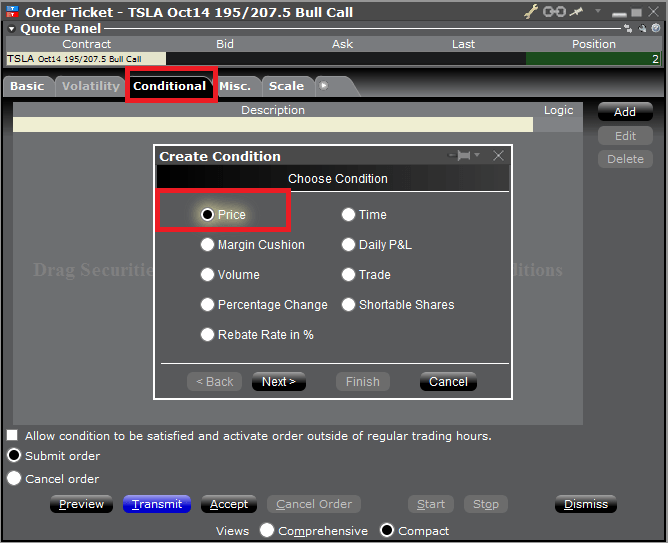 We will illustrate a detailed example using conditional orders and the snap-mid orders at Interactive Brokers. 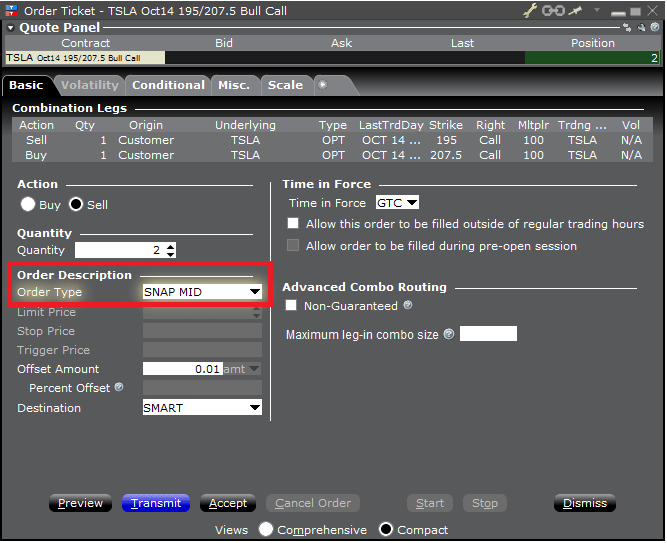 Step 1: We are long on TSLA, using a 195/207.50 Oct 14th Bull Call Spread, costing us a total of $1,052 for two contracts. This position is currently worth $1,396, which means we have a $343 unrealized gain. Step 2: Where do we place the stop loss? Let’s look at the TSLA stock price chart. Based on our technical analysis, we decide we want to close our option trade when the stock trades below $202.12. 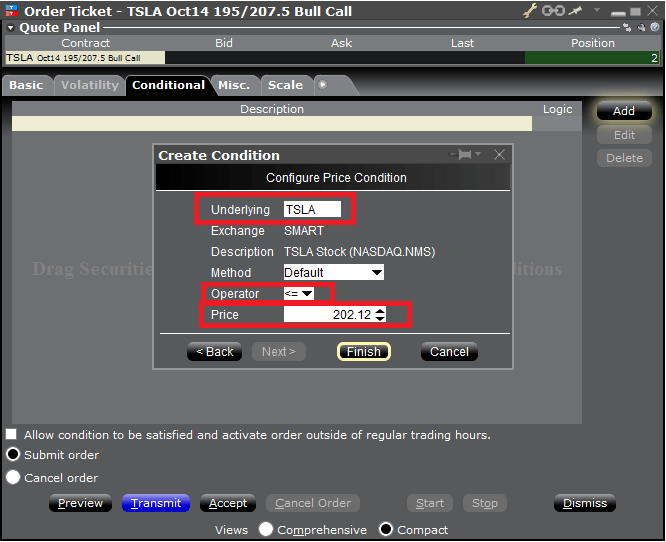 Step 3: Let’s setup our sell order on Interactive Brokers, by right-clicking the position and selecting “order ticket”. The reason we do not use market is because this order type will mean that we sell the spread at whatever the market makers are willing to pay us. Obviously, using this order type is very risky because you never know where your order will end up for execution – a lot of brokers (including IB) send their order flow to dark pools where algorithms and high frequency traders can use them however they want, including front-running them. 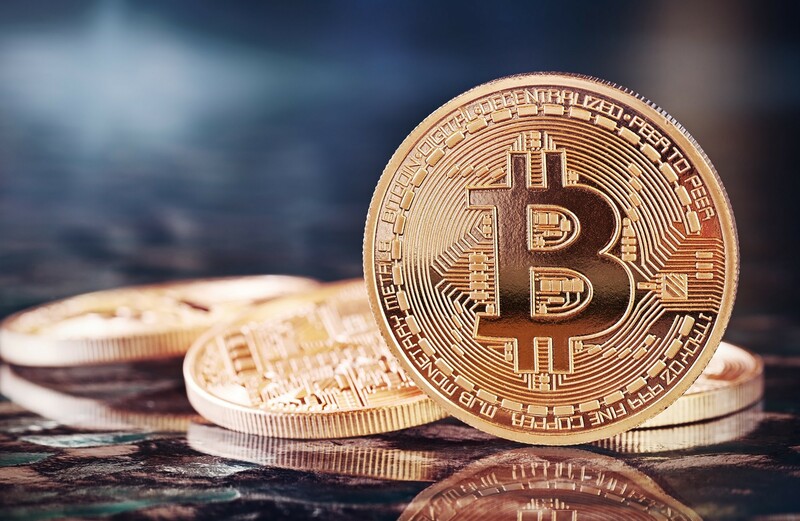 Even if you are not front run, you will end up being executed closer to the bid and end up receiving less of the proceeds. Option orders should be sent at what’s called the “mid-price”. This is the distance between the bid and the ask. For example, if your options spread is bid @ 2.95 and ask @ 3.10, you should reasonably expect to be filled at the mid price, or around $3.00 even. If you send a market order, it will likely be executed closer to $2.95, and you will lose out on the extra $5. Not bad if it’s one contract, but imagine trading 10? That’s $50. Now apply that to 30 trades a month – that’s $1,500 extra profit! It adds up. The “snap-mid” order is a very useful order type at IB – it allows you to release the spread at the mid price, and follow that mid-price as it changes until you are filled. This will NOT guarantee you get filled like a market order, but you will be filled very quickly like a market, and retain the majority of the proceeds. This tells IB to sell the 195/207.50 bull call spread @ the mid price when Tesla trades below $202.12. You can also set a number of criteria which must be met individually or together at the same time! More on this in another post. It is that simple! In a few steps you can start placing stop losses on option spreads based on the price of the stock, helping you take risk when it is appropriate and get out of a trade when the trading setup actually breaks down. This will save you a lot of time and energy trying to figure out what an option will trade for when a stock hits a certain level. There are too many variables to guess in that method, including volatility, time decay and the rate of change of delta (gamma). This method will also increase your percentage of winning trades. Now you can trade options while you do something else, and let the market handle your executions when YOUR criteria is met! Intraday Trading-How to day trade for a full time income.